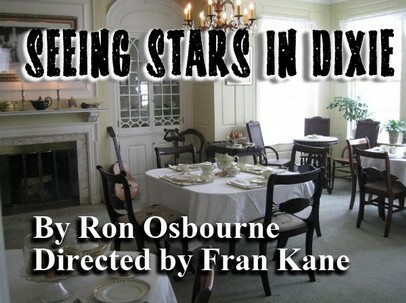 "SEEING STARS IN DIXIE" will be the first show of the 2012 / 2013 season. It's 1956 and Hollywood has arrived in Natchez, Mississippi with its brightest stars to film Raintree County . Meanwhile at Clemmie's, a Natchez tea room, the widowed proprietor who has a fascination with movies and a secret admirer, oversees her own cast of characters: Tootie, her take charge friend; Jo Beth, a former beauty queen; Glease, a man more comfortable with women than macho men, and Marjorie, an unethical social climber. Competition for a small role in the movie brings out the best and worst of these memorable characters. Twists, turns and revelations lead Clemmie to trade a moment of fame for love and the chance to impact the lives of people dear to her. Originally produced at the Sonoma County Repertory Theatre in Sebastopol, CA. Reservations are strongly suggested for Sunday matinees as they are extremely popular. Patrons can call our machine at 215-245-7850. The Playmasters, State Rd. ¾ mile north of Street Road, Bensalem.